China’s National Development and Reform Commission (NDRC), together with six other government agencies, announced the nationwide implementation of China VIA motor gasoline (including E10) and China VI diesel fuel (including B5), effective 1 January 2019. The other six agencies are the Ministry of Public Security, the Ministry of Ecology and Environment, the Ministry of Commerce, the State-owned Assets Supervision and Administration Commission of the State Council, the State Market Supervision and Administration, and the National Energy Board. China’s Phase VI/VIA vehicle fuel standards are equivalent to the European Union’s Euro 6, with a maximum sulphur content of 10 parts per million (ppm). 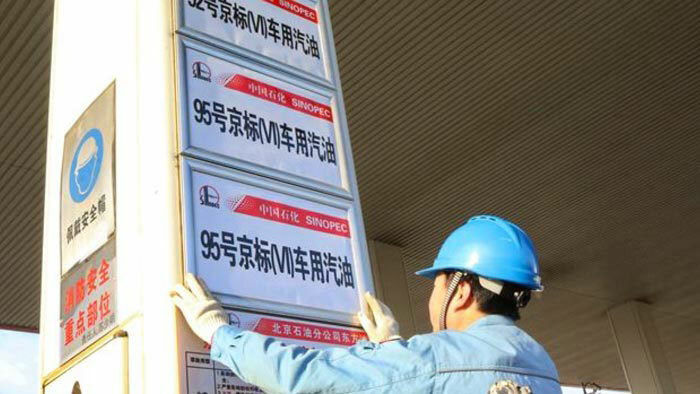 China VI specification for gasoline is divided into two grades — VIA and VIB, with different olefins content. The implementation of China VIB motor gasoline, with an olefin content of 15% compared to VIA’s 18%, is expected to be implemented by 2023. S&P Global Platts Analytics estimated China’s apparent gasoline demand in 2018 at 3.43 million barrels per day (bpd), and diesel fuel slightly higher at 3.94 million bpd. The NDRC announcement also requires oil refineries, distributors and sales enterprises to strengthen their oil quality management and control to ensure the supply of clean oil products nationwide. Further, fuel retailers are required to clearly display the name and the grade of gasoline and diesel fuel products being sold at service stations, e.g., No. 92 motor gasoline (VIA), etc. In February 2013, the State Council issued a timetable for its program to upgrade China’s fuel quality nationwide. In April 2015, the State Council advanced the timeline for 10 ppm gasoline and diesel fuel (China VI) by one year. The capital city of Beijing was the first to implement China VI in January 2017. China VI was then expanded to 28 cities in September 2017. In June 2018, the State Council announced the Three-Year Action Plan for Winning the Blue Sky Defense Battle, which mandated the phase-out of ordinary diesel fuel. China VI fuel (GB 19147-2016) would be used for on-road, off-road and some marine applications starting 1 January 2019. The transition from China V to China VIA would be completed 31 December 2018, after which, China V gasoline and diesel fuel would no longer be available. The transition from China VIA to China VIB would be completed by 31 December 2022, after which China VIA gasoline would no longer be available. The primary difference between China V and China VIA is the lowering of the benzene, aromatics, and olefins limits from 1.0, 40 and 24 to 0.8, 35 and 18% volume, according to the website Dieselnet. 98 RON fuels can be offered if a producer has production capability. For both China VIA and VIB, the olefin limit for 98 RON gasoline is 15% volume, whereas for lower RON gasoline such as 89, 92 and 95, the olefin content for China VIA is 18% volume. The use of gasoline additives containing methanol, lead, iron and manganese, such as methylcyclopentadienyl manganese tricarbonyl (MMT) will no longer be allowed. Ethanol blends are also used in China. In September 2017, the National Energy Administration announced a plan for nationwide use of E10 gasoline by 2020. With respect to diesel fuel, the switch to China VI would restrict polycyclic aromatic hydrocarbons (PAH) content to 7%, from 11%.